To the people who have already read Willow the Vampire and the Sacred Grove it will come as no surprise that Stinkforthshire’s vampire community is not adverse to some gourmet wining and dining (bloodsucker-style, naturally). We are not talking about your typical Jamie Oliver, Hugh Fearnley-Whittingstall or Delia Smith recipes here – I’m fairly certain cured vicar with lettuce or spiced bloodwine are not among the latest editions of their culinary offerings. Food plays such a large part of a human’s life, why should this be different for vampires? It’s always bugged me that vampires in film and literature are mostly being displayed as fairly simplistic creatures (except for Elizabeth Kostova’s “The Historian”, where the vampire is a very sophisticated creature of the night = one of my favourite books of all time). This blog’s creatures of the night have so far shown us that survival depends very much on being an omnivore. Red Pandas and other creatures too fussy about their diet suffer greatly at the hands of humans, as loss of habitat as much as poaching endangers their lives. With loss of habitat comes a smaller food source, less food means starvation and extinction. Vampires might not be in danger of running out of their favourite food source, but with humans “polluting” their bodies with fake sun tan spray, tanning generally, alcohol and drugs, not to mention prescription drugs and fatty foods, bloodsuckers might also soon despair of finding food that doesn’t harm them…even though they are supposed to be immortal, it doesn’t mean they can’t suffer from permanent hangovers, headaches, stomach upsets and general feeling of being unwell. So are there any cures against human blood and flesh turned bad? Among the mythical plants used in Odinism and Wicca as well as in ancient magic spells are some plants of the nightshades family (Solanaceae), in particular the famous mandrake plant. The mandrake root or plant genus Mandragora contains deliria hallucinogenic tropane alkaloids as well as bifurcations, which is partly responsible for the odd shape of the mandrake root. 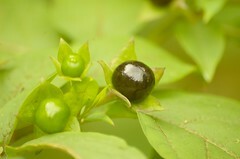 Belladonna is another famous plant that contains tropane alkaloids and ranks therefore as one of the most toxic plants in the world. The plant is also known as the Deadly Nightshade and its effects on the unsuspecting human – an presumably equally unsuspecting vampire – are frightening spells of delirium and hallucinations. The Belladonna plant was used as a plot device in one of the early Merlin episodes (BBC, season 2, ep. 7 “The Witchfinder”), where a fake witch finder uses it to induce mass hallucinations in several women, who are given Belladonna in form of eye drops, which are supposed to make a person’s eyes more beautiful. In medieval times, however, Belladonna was used in medicine, namely as an anaesthetic during surgery. Whatever Alice Band the vampire – also known as Willow’s Mum – puts into her bloodwine recipe, it is fair to say her husband is not just partial to it because it tastes of cinnamon! All parts of the mandrake plant are poisonous to humans, from its tobacco shaped leaves to its whitish-green or purple flowers and its human shaped root. Legend has it that anyone who digs up a mandrake root will be killed by its violent screams. 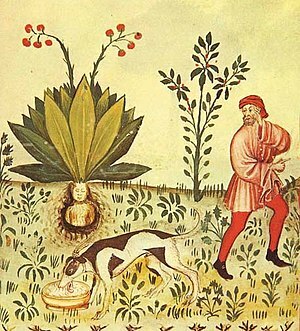 Harvesting a mandrake plant is in itself a risky and mysterious business. At J K Rowling’s Hogwarts Harry and his school mates have to wear gloves and ear muffs to protect themselves from the mandrake root’s screams and bites. In magic spells mandrake is used to bewitch those who are given it. From its mild narcotic to aphrodisiacal elements, the mandrake plant has played a part in “medicine” and “magic” throughout the ages. Both Machiavelli and Shakespeare used references to the toxic plant in their writings, but interestingly the former uses it to bewitch a woman to go to bed with his protagonist, while the latter uses it as a sleeping draft. In other writings (Salmon Rushdie and Guillermo del Toro for example) the mandrake plant becomes a magical cure for illness. Oddly enough, the mysterious mandrake belongs to the family of far less mysterious potatoes, just like eggplants and tomatoes. Although many nightshade plants are used by humans either as food or in medicine or to spice meals, many are so rich in alkaloids that they can actually kill humans when taken in in just small quantities. Many of the plants and hedgerow offerings we see today were used in medieval times as sources of human food and also for healing. Nettles, dandelions, St. Johns Wort, hawthorn berries and elderberry, honey and tree bark all had their role to play. Medieval monks ran the only “hospitals”, where the wealthy could get some form of healing and where many knights were helped with their battle wounds. Various herbs were used in combination with vinegar for burns treatments, insect bites and skin ointments. BTW, raw onion is an excellent remedy against bee and wasp stings, I’ve tried it myself lots of times. Angelica was a medicinal plant brought from Scandinavia to the rest of Europe. Its healing powers were used to help mainly with respiratory diseases, while arnica was used to help knights with wounds and bruises, of which they must have had many, just from jousting, never mind going into battle during the crusades. Which brings me to my plans for this Sunday, when I shall be watching “real” knights battling it out at “Joust”, held at Cardiff Castle, yay! You can look forward to lots of pictures in future posts, provided my stupid camera won’t let me down again, sigh. Love it! Don’t talk to me about The Historian – we bought it on CD to listen to in the car. I really loved it the first time. Unfortunately, so did Will. I think that after listening for about the fifth time, I wanted to eat the CD to get rid of it. However, that was a few years ago and I can’t remember that much about it. I might be ready to listen again. I have always been a big fan of herbs for healing. I particularly liked the bit about vampires having to put up with fake tan and alcohol in the blood. I hadn’t thought of that, it really made me laugh. Thanks for the compliment. Try reading the book rather than listening to it. Audio CDs always make changes to the text. Haven’t forgotten uploading your review, but having problems this week with my internet connection, it seems. will try again this w/e. I have heard of the mandrake plant before, but I didn’t know anything at all about it. I was intrigued about the properties of this plant just unreal. thanks very much. Is anyone else having problems uploading blogs to WP this week? My connection keeps failing. There have been a lot, some have fixed the problem by taking of adblock from firefox, others are still having problems.